Historically, the Spanish Grand Prix weekend has been the scene of the most significant technical upgrades of the season, and it would appear likely that this is the case in 2017 too, with substantial developments appearing up and down the pitlane. Here, I take a detailed, but not exhaustive look at some of the updates that appeared. Mercedes brought a number of developments to its W08 for the Spanish GP, and one of the most significant was a new rear wing, used throughout the weekend. The more conventional design on the W08 no longer features a distinctive U-shape, and this is not entirely surprising considering the old edition was favourable for medium, as opposed to high downforce tracks. This new design will improve the downforce produced at the rear of the car, with a higher average angle of attack, although the wing tip vortices shed will be of greater strength, harming straight-line speed. However, the wing was not designed simply with absolute downforce in mind, as the tips of the wing flap were reduced in height, to not only reduce skin friction drag, but also to lower the aforementioned vortex drag, albeit not to the previous value. Compared to Mercedes, Ferrari’s Spanish GP upgrade was modest, but considering the team ran with all the new pieces in its race configuration, it should also be judged as a success. After upgrading its front wing significantly for Bahrain, the focus was more on the rear half of the car, starting with the addition of two slots to the bargeboards. 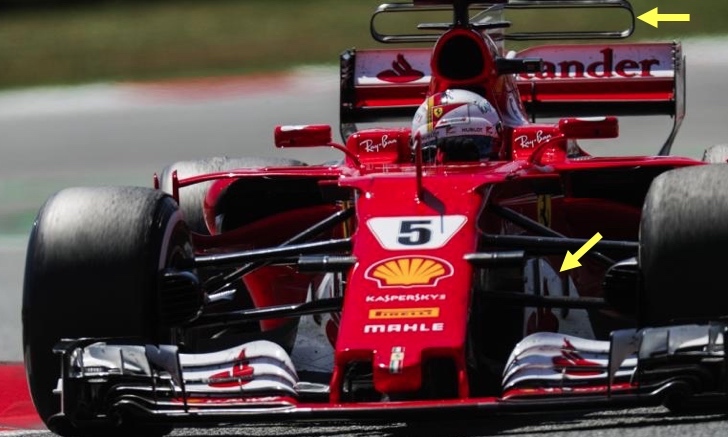 Usually, the addition of these slots to a curved surface would aid its efficiency, and this indeed seems to be the case on the SF70H, with the slits appearing at the onset of the point of highest shape change along the bargeboards’ geometry. This will reduce the peak pressure differential either side of the bargeboards, lowering the strength of the vortices produced, but will direct more air, from the inboard surface of the bargeboard, outboard of the chassis to dissipate the front tyre wake, thanks to improved flow attachment. A much more aggressive T-Wing was run on the SF70H throughout the Spanish GP weekend, consisting of four elements, as opposed to just one on the previous design. Both the upper and lower configurations feature a noticeable angle of attack, whereas the old design relied more on camber for downforce production. An endplate has been added to the part to reduce the strength of the wing tip vortices, a key consideration with the higher drag machines of 2017. Red Bull’s updated RB13 was less radical than many suggested it would be, and as a result, the step in performance to the front runners was moderate. The qualifying gap of six tenths was a little better, taking into account that the deficit at a similarly power sensitive track (Bahrain) was one second. Firstly, the camera mounts were placed further back and higher up for Barcelona, compared to the first four races. This will have been aimed at minimising disturbances to airflow further back, and the new design appears more intuitive in this regard, given its alignment with the front suspension’s upper wishbone. Furthermore, the size of the sidepod intakes was reduced noticeably, the result of which is a greater sidepod undercut. This change would have been initiated by improved internal packaging and cooling efficiency. Reducing the mass flow rate of air into the sidepods will reduce drag, as airflow can take the cleaner, outside route as opposed to encountering many drag inducing devices inside the car such as radiators and other pipework. Lastly, the sidepod’s leading edge slat, already modified for Australia, received further attention. It now stops more outboard, which is a change most likely aimed at drag reduction. The purpose of this slat is to improve the attachment of airflow to the sidepod, as airflow colliding with the area just above the sidepod intake will tend to have an appreciable vertical velocity component at the sidepod’s leading edge, making separation more likely. With the drop off in sidepod shape being much less pronounced further inboard compared to the outside of the sidepod, Red Bull clearly felt that the improved flow attachment, and lower pressure drag, was not high enough to outweigh the part’s skin friction. Williams has continued its philosophy of introducing small developments, as opposed to making wholesale changes, in the manner of better funded teams. This need not be a negative however, as a similar philosophy has been employed in the last three years, with strong results being obtained throughout each of these season. For Barcelona, the shark fin was modified, featuring a cut-out before the T-Wing. Making this alteration should enable the T-Wing to work to its full potential in a greater variety of conditions. 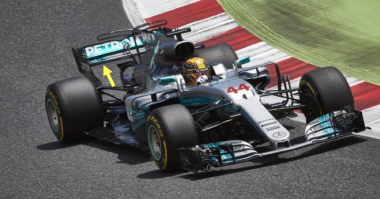 When undergoing an oversteer moment, for instance, the old shark fin would have prevented airflow from flowing over part of the T-Wing, but removing some of this obstacle uses more of the wing, yielding greater rear load. Not only this, but improving the load distribution either side of the wing will reduce the moment created, lowering shark fin vibrations and resulting in aerodynamic stability gains. The cut-out has not been extended right to the start of the T-Wing for structural reasons – doing so would counter-act these stability benefits. On the STR12, winglets either side of the front bulkhead were added for Barcelona, in an area that other teams have already exploited, with the greater freedom in the 2017 regulations. It is unclear exactly what the fins will achieve, but it is possible that they will direct air downwards, towards the sidepod intakes, in order to raise the mass flow rate of air through the sidepods, for improved cooling efficiency. Alternatively, they will shed vortices due to their aeroplane wing shape that will aid the sidepod leading edge slats (also visible above) with regard to airflow attachment over the sidepods. Renault introduced a new rear wing in Spain, which differs from the previous edition in both the flap and mainplane designs. The previous design of the mainplane was a little confusing, as the angle of attack at the endplate was actually greater than that at more central regions of the wing, which would be conducive to higher strength wing tip vortices, and greater induced drag. This is no longer the case, with a flat mainplane being used. The new flap is longer, and set-up with a greater angle of attack relative to the oncoming airflow. 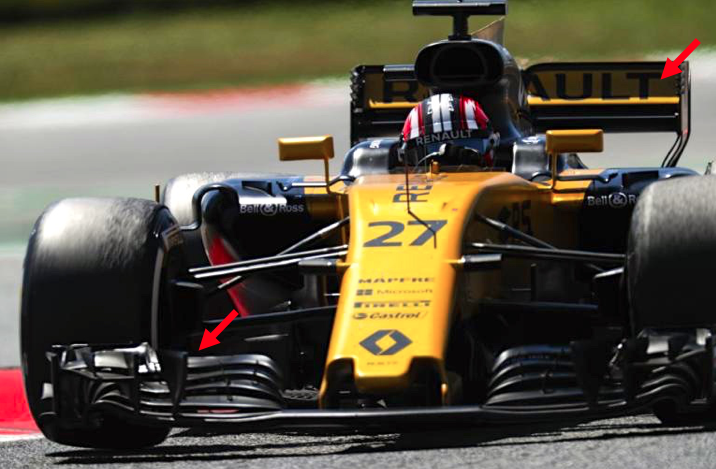 The purpose of this device is to increase the downforce produced, from the overall wing, for the same angle of attack, and Renault will have been looking to optimise this effect as much as possible. The benefits are more downforce for the same probability of flow separation (same AoA), and the same skin friction drag, which is very much a worthwhile gain. The new flap also features a larger gurney tab, which will raise the static pressure on the upper surface of the wing even further, for greater rear load. Lastly, it should be noted that the Enstone outfit reduced the size of the new front wing flaps on the R.S.17, introduced in Russia, in order to better balance the car’s front and rear downforce – this will not only improve one lap pace, but also tyre life over a race stint. 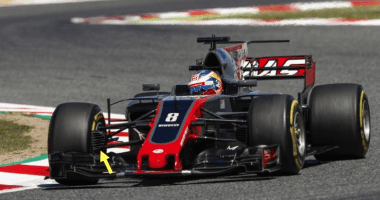 Haas arrived in Spain with a moderate upgrade package, but one that appears to have kept it in the thick of the midfield battle. A new front brake duct was used, with a grille at its intake – this is similar to the design run by Ferrari so far this season. Primarily, this will straighten the flow entering the duct, reducing internal drag, as the flow does not move around chaotically. As internal drag is lower, the velocity of air through the duct, and indeed out through the blown front axle, will be higher, leading to improved brake cooling and aerodynamic benefits at the rear of the car.